I get my Highlander washed every month at one of those car washes that you pass slowly through in Neutral as your car gets doused in lots of water and bubbles and scrubbed clean with huge twirling brushes. I try to take Sam with me whenever I go. This is mostly for my own benefit. He likes it, but it makes him nervous, which I find hilarious. 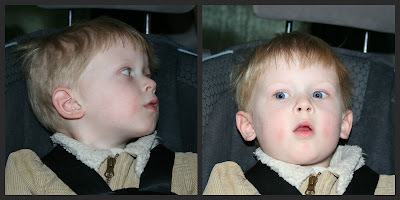 I kept trying to remember to bring a camera to capture his funny expressions and then I got an iPhone which has a good camera built into it, so I finally got some pictures of the kids in the car during the car wash. So funny! This picture is the best and makes me laugh or at least smile every time I see it! When we're at the end and we drive outside in our nice clean car, he smiles and says "All done!" You can tell how relieved he is. He's learning the classic lesson that all is well that ends well. It certainly does-- especially when it gives Mom a good laugh!